Since starting this site I have had several requests for band purchases. Many roller fliers have become dissatisfied with the large 8 mm plastic coated bands commonly sold for rollers which are actually intended for Racing Homers. 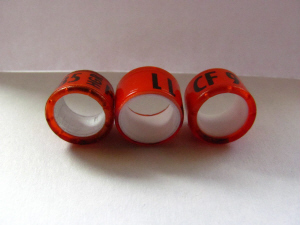 Some fliers have reported that these .8 mm bands are easily removable from adult birds and that some of their rollers have actually had their bands come off while spinning. 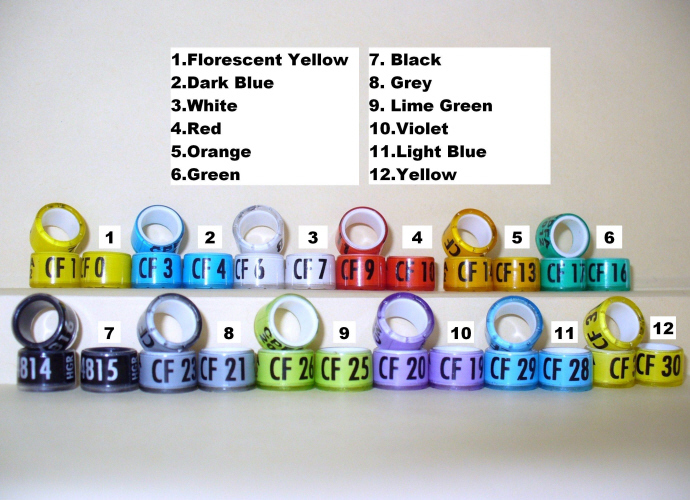 The bands I am now offering for rollers are only .7 mm and a little less than .5 mm in height and will not come off once on. Since they are completely made out of plastic with a white sleeve, the colors and print are much more vibrant and clearer than those with an aluminum sleeve. I am the only US agent for this particular style of band with the white sleeve. 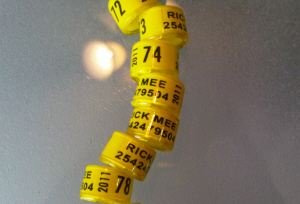 I can get these bands in sizes .6 mm for small pigeon breeds, up to .13 mm for large pigeon breeds. 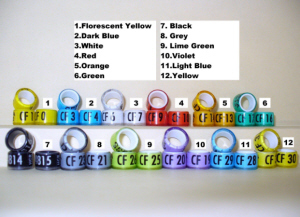 USUALLY I will have on hand .7 mm bands available for immediate delivery. On line one they will say BIRMINGHAM, second line ROLLERS, then the current year and serial numbers. Email if you want a specific lot number. American Flying Tumbler, Arabian Trumpeter, Archangel, Flying Baldhead, Breslauer Tumbler, Brunner Pouter, Catalonian Tumbler, Cumulet, Danzig Highflyer, Figurita, German Nun, Gumbinner, Hamburg Sticken, Helmet, Italian Owl, Starling, Flying Tippler, Hyacinth, Laugher, Nuremberg Lark, Polish Owl, Portugese Tumbler, Flying Oriental Roller, Parlor Roller, Parlor Tumbler, Performing Roller, Polish Murzyn, Sroka, Rzhev Startail, Syrian Turbiteen, Taganroger, Vienna Medium Face, Zitterhall, All Clean Leg Shortface Tumblers. African Owl, Altenberg Trumpeter, Miniature American Crest, Ancient, Aachen Lacquer Shield Owl, Baku Tumbler, Berlin Longface Tumbler, Bernhardiner, Old Dutch Capuchine, Chinese Owl, Chinese Nasal Tuft, Holle Cropper, Shield Cropper, Norwich Cropper, Danish Tumbler, Domestic Show Flight, Donek, Dutch Highflyer, Elster Purzler, English Nun, Flying Flight, Fantail, German Modena, Clean Leg Ice Pigeon, Jacobin, LFCL Tumbler, Komorner Tumbler, Koros Tumbler, Macedonian Turbit, Mookee, Old German Owl, Oriental Roller, Show Roller, Bohemian Pouter, Hessian Pouter, Horseman Pouter, Pigmy Pouter, Swing Pouter, All Spanish Pouters, Silesian Pouter, Thuringer Pouter, Czech Ice Pouter, Show Type Racing Pigeon, Racing Homer, Ringbeater, Schecken, Show Tipler, Spanish Barb, Syrian Fantail, Srebniak, Suabian, Egyptian Swift, Syrian Swift, South German Priest, Temeschberg, Franconian Velvet Shield, All Thuringer Color Pigeons, Ukranian Skycutter, Voorburg Cropper. American Show Racer, Carneaux, English Carrier, English Show Homer, Florentine, French Bagdad, Frillback, German Beauty Homer, Hungarian English Pouter, Kazaner Tumbler, LF Muff Tumbler, Moorhead Tumbler, North Caucasian Tumbler, Oriental Frill, Persian Roller, Ptarmigan, Rostower, Royal Seljuk, Royal Snow Tumbler, Scandaroon, Show King, Strasser, Syrian Coop Tumbler, Texan Pioneer, Utility King, Volga Tumbler, West of England Tumbler. Bavarian Pouter, Dutchess, Fairy Swallow, French Mondain, Fullhead Swallow, Giant American Crest, Giant Homer, Ice Pigeon, Indian Fantasy, Indian Fantail, Indian Mondain, Lahore, Old Dutch Tumbler, Russian Tumbler, Saint, Saxon Shield, Saxon Breast, Saxon Field Pigeon, Saxon Monk, Saxon Priest, Saxon Whitetail, Schmalkalden Mohrenkopf, Silesian Swallow, Swiss Crescents, Swiss Mondain. Dutch Croppers, Ghent Pouters, Giant Rumblers, Giant Runts, Hungarian Giant House Pigeon, Hana Pouters, Pomeranian Pouters, Reversewing Pouters, Saints, Saxon Pouters, Trumpeters. These bands are also superior to the English style solid metal bands due to the fact that much more information can be printed on these bands and the lettering can never rub off which often occurs with the English style bands rendering them hard or impossible to read. 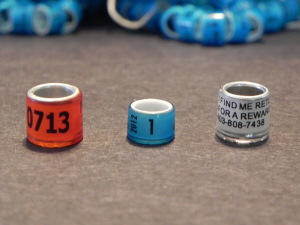 These Personalized Number Bands are a custom plastic band with two lines of up to 12 spaces per line, you do not need to be a member of a club to receive these bands. The year will be read vertically if you customize each of the two lines, or it can be included as one of your two lines. The number sequence can be selected by yourself but the numbers must be in sequential order. The two lines provided can be used for your personal name or loft name, club initials, phone number, or an email address. Simply use your imagination and if it fits I will place the order for you. NOTE: If you want your phone number listed the dashes between numbers count as a character. Year will be vertical, refer to pictures. 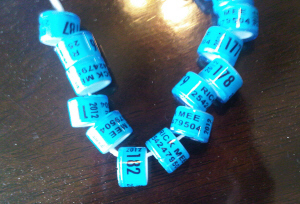 Numbers 1-100, or say 801-900, multiples of 100 up to how ever many you want. If ordering for a club you could have 1-2500, or as many as you want. Since the year is on one of the two lines I can actually go up to 14 characters. Year will be vertical, or leave the year off. Some Roller, Tippler, or Homer fliers like to use these bands as a name and address band on one leg, they use their club band on the other leg. NO YEAR, this band is being used solely as a name and address band therefore I can have up to 14 characters since the year will not be included on this band, numbers still can be included if you wish with out the year. Personalized bands with out the year can be sent out once completed, next year bands will be sent out in December of the current year. 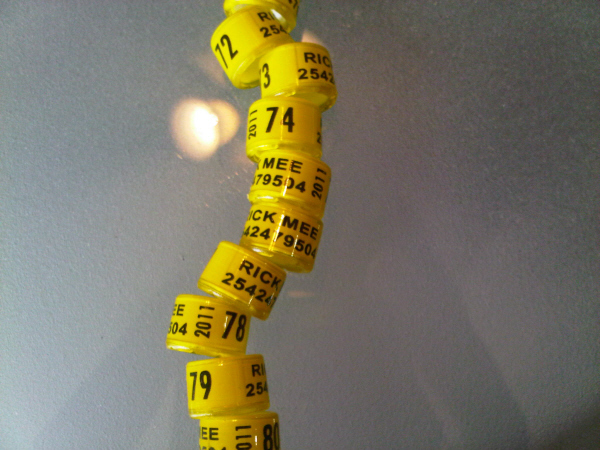 IF YOU DO NOT WANT THE YEAR ON YOUR BANDS THEN YOU CAN HAVE UP TO 14 CHARACTERS PER LINE INSTEAD OF ONLY 12. USE YOUR IMAGINATION, YOU CAN HAVE ANYTHING YOU WANT PUT ON YOUR BANDS AS LONG AS IT FITS. IF YOU HAVE ANY QUESTIONS THEN EMAIL ME AT WCSPINNER@AOL.COM FOR ADVICE OR CLARIFICATION. IF YOU DO NOT EMAIL ME THEN I WILL JUST ASSUME THAT YOU ARE ORDERING BANDS FOR THE CURRENT YEAR AND THAT IF YOU FOR EXAMPLE ORDER 100 THAT YOU WILL WANT YOUR NUMBERS 1-100. 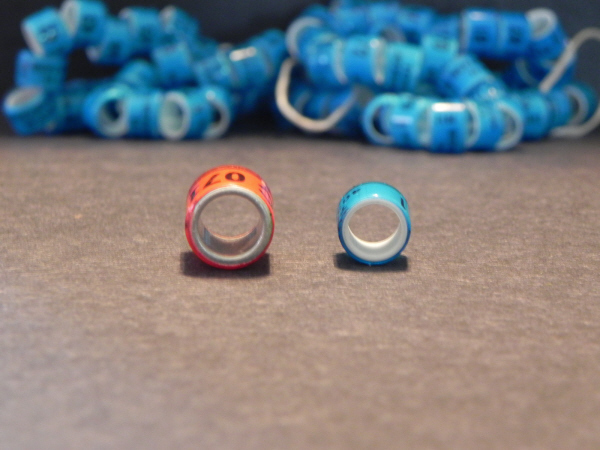 The band on the far left shows the aluminum sleeve, the one in the middle and far right are the ones being offered showing a few different examples of how you can have your bands printed, possibilities are virtually unlimited just as long at it fits. Again, notice the difference in coloration between the traditional aluminum sleeved band and the new all plastic white sleeved band. I will be shipping next year's bands the middle of December. If you are ordering current year bands then allow 6-10 weeks for delivery. IF YOU ARE ORDERING A BAND FOR THE CURRENT YEAR OR ONE WITH OUT THE YEAR THEN THEY WILL BE SENT OUT THE CURRENT YEAR. When placing your order pick the color and what will be on both lines, 12 characters per line if the year will be printed vertically, 14 characters per line if the year will be included on one of the two lines or if no year is going to be used, then click Add To Cart which will give you 100 bands of that color. When you go to check out on the next screen you will be able to change the quantity to a higher number than 100 bands if desired and your pricing will automatically calculate. IF YOU WANT A PARTICULAR LOT NUMBER THEN EMAIL ME AT WCSPINNER@AOL.COM THE SAME DAY YOU PLACE YOUR ORDER SO I CAN ANNOTATE WHAT NUMBER SEQUENCE YOU WANT. Sold ONLY in multiples of 100 bands. $50.00 USD per 100 bands, $3.00 shipping within the continental United States. NOTE: If you reside outside of the US email me at wcspinner@aol.com to find out what your shipping costs will be after you have decided what your quantity will be. For example, a quantity of 1 = 100 bands, quantity of 2 = 200 bands, and so on. 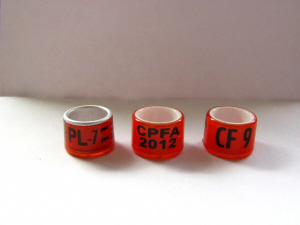 The red and white bands show the height of the standard plastic coated 8 mm band being used by many roller clubs. 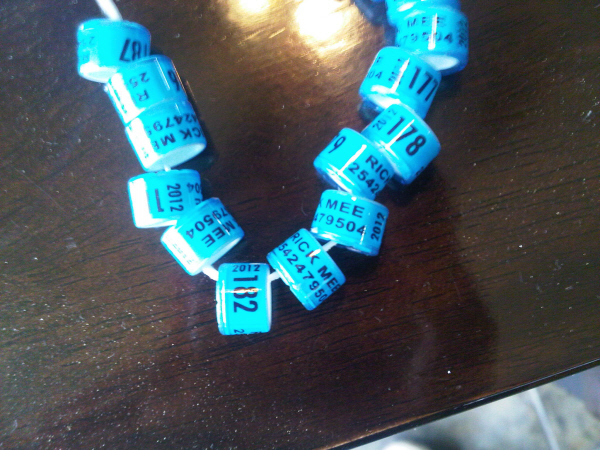 The light blue band in the middle is the 7 mm band I am offering. Notice how clear the lettering is and the height differences. 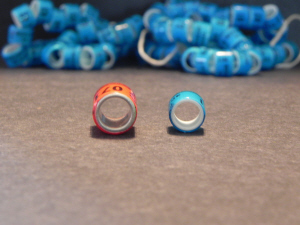 The red band on the left is the standard 8 mm band being used by many roller clubs, the light blue on the right is the 7 mm band I am offering. Price for 100 bands is $50.00.